I am not Jewish. Either by birth or religion. 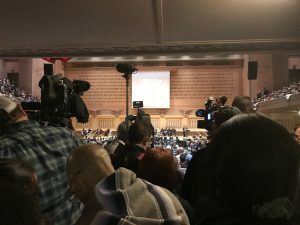 Still, I felt compelled to attend last night’s public memorial for eleven people who were murdered in a Squirrel Hill neighborhood in Pittsburgh, PA. 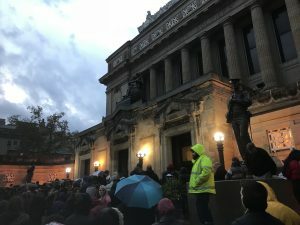 The service was held at Soldiers and Sailors Memorial Hall and Museum, where thousands packed the hall and thousands more stood in the chilly rain outside. 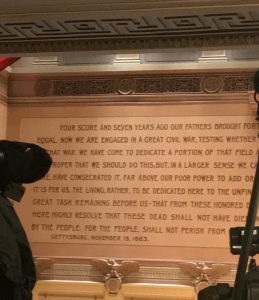 Once I managed to squeeze inside, I thought how fitting that Abraham Lincoln’s words from his Nov. 19, 1863, Gettysburg Address are inscribed on its walls. I live ninety minutes south of Pittsburgh. I still remember family trips we took there, beginning in the early 1970s. 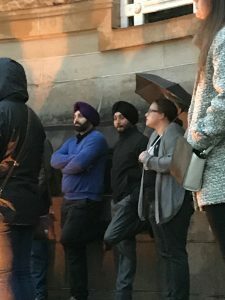 But more recently, one of my daughters reintroduced me to the melting pot that is Steel City, a place built and inhabited by immigrants from all walks of life. Thanks to her, I probably spent more time there during the last six years than all the other years combined. So I felt the city’s loss keenly. At first, I tried not to think about it. Then I learned that four police officers who tried to stop the gunman were shot in the line of duty. My entire adult life has been spent with and around law enforcement, so I felt a sense of camaraderie, for them and their families. Finally, I heard that the victims’ names had been released—and I thought about all the people I had met during recent visits to Pittsburgh. Wonderful people, many of whom are Jewish. I recalled the warm and cozy times my daughter and I dined at Dobra Tea, one of her favorite Squirrel Hill haunts. Given that, there was no way I could not go. Paying my respects was the least I could do. I don’t hate anyone. However, I do hate the actions that some people take, like happened Saturday afternoon when Robert Bowers, 46, opened fire and killed eleven people at the Tree of Life Synagogue. Why did this happen? Because Bowers looked at those parishioners and saw only a label: Jewish. It also happened because there really is evil among us. I know a little about evil, having covered a local murder here a few years ago. Evil is the only explanation for how two bright, talented and pretty teenage girls could murder a third teen who had once been a close friend. Since then, hatred for people who are different than us has only increased. Especially is this true for those of the Jewish faith. “Us,” as I use it, is anyone who aligns himself or identifies with, a specific group that spews hate speech toward people who are different, or with whose views they disagree. Not everyone who identifies with a particular label (think alt-right or even Democrat or Republican) feels or acts on hatred—but many of them do. I know about hatred inspired by labels, because I grew up in a religious home. And while wearing that label as a child of eight, a woman chased a friend of mine who was thirteen and me from her porch—with a broom. About ten years ago, I was with a developmentally disabled youth, knocking on the door of another home, in a different community. In return, the man let his vicious dogs loose to chase us away. 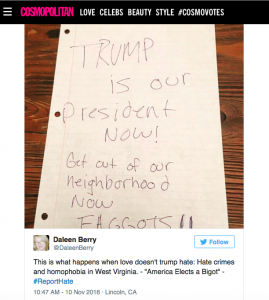 In both cases, we didn’t speak badly, or retaliate, against either homeowner. We acknowledged that, while morally wrong, their actions arose from ignorance. Because, after all, we came in peace, offering a message of love. Had they stopped to listen, or think, they would have realized this. And perhaps our compassion would have won them over. I like to think so. Given that none of Bowers’ neighbors really knew him and people who attended high school with him recalled him as a loner—if they remembered him at all—is proof that a little compassion could have gone a long way. For instance, mental health experts know that isolation is dangerous. Whether self-imposed or not, people cut off from family and friends tend to become unstable. How could they not? Humans are tribal people. We came from family units, and were designed to be part of a society. That’s why people like Bowers are called anti-social. Another label, one that need not exist—if only people would stop and pay more attention to the outcasts and loners among us. I am reminded that when the Jews and others were loaded into cattle cars and placed into concentration camps during World War II, they were known not by their names—but by numbers, and labels sewn onto their prison garb. A yellow triangle for Jews, a purple one for Jehovah’s Witnesses, the letter “P” for Polish prisoners. Labels allow us to dehumanize our fellow man: white, black, Jewish, Catholic, straight, gay, handicapped, decrepit, rich, poor, or immigrant. What if we stop using labels altogether, and simply view each other as we are: human beings? That is to say, people from the same species, who are just like you and me. We are all just human beings in need of kindness, especially now. 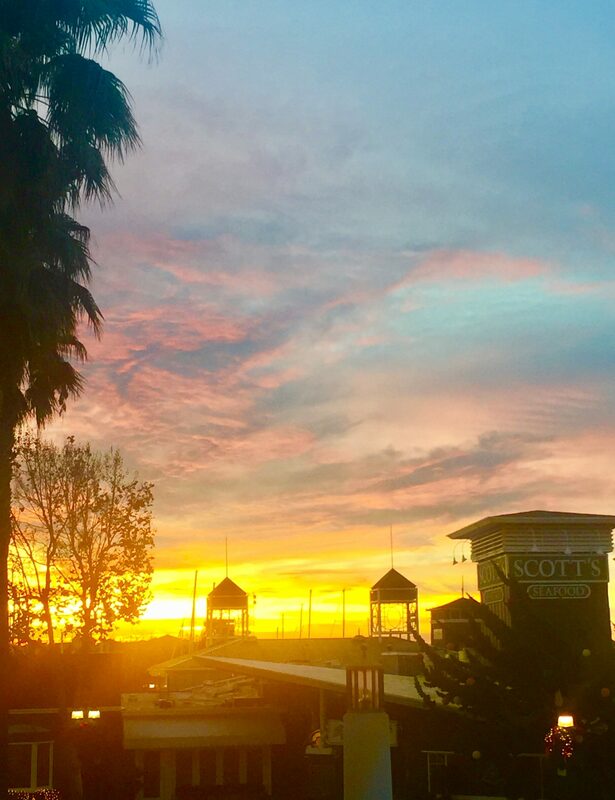 What if, every time we’re in the company of someone who appears different from us—whether we’re merely passing each other in a crowded crosswalk or sitting down in a classroom, sports stadium or movie theatre—we instead think: this person is my brother? My sister? Or, what if we go a step further and speak to those strangers? Invite them for coffee or a meal? Offer them a shoulder to cry on? Ah, but that’s when the power for change really happens. R&B musician Daryl Davis knows this. “Establish dialogue. When two enemies are talking, they’re not fighting,” he told the Daily Mail in 2013. I heard Davis speak a few months ago, while listening to an episode of Snap Judgment. I was fascinated as I heard the blues musician tell how he became friends with a high-ranking member of the Ku Klux Klan. That man later resigned his post. Why? Because through his friendship with Davis, a black man, that previously racist white man came to know a basic human truth: no matter our race, religion, gender, or ethnic background, we are more alike than we are different. Knowing this truth, and then acting on it, is how love can overturn hate.